Rebecca Janney Timbres Clark led a remarkable life that spanned all of the twentieth century. This pamphlet explores one year in that life, the year when a young, sheltered Quaker from Baltimore took the first steps toward a career of service that would take her around the world. “The forging of a person’s character takes a lifetime,” writes Lyndon Back. “Yet there are periods along the way when outer circumstance and inner forces combine to form a crucible, a time of transformation. Rebecca’s year as a volunteer for the American Friends Service Committee in Poland at the end of the First World War was one of those times. 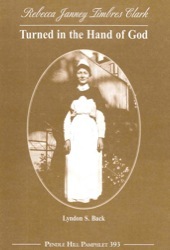 She was twenty-four years old, unmarried, and just out of nurses training. . . .” Based on diaries, letters, and other archival resources, a young woman’s quest for faithfulness and meaning comes to life.